While climate change plays an important role in the increased frequency, duration, and intensity of extreme weather events, the lack resiliency of our urban environments to these issues and the amplification of these problems lies in the way our society approaches rainwater. Despite being a critical factor in the location and development of cities, determining the success and failure of empires, water is mostly ignored in today’s Western cities. This is perhaps because of its prevalence and abundance in everyday life and the disconnect from ownership and responsibility over water which has been a product of our cities from the early 19th century. Rainwater in cities is considered and treated as waste. 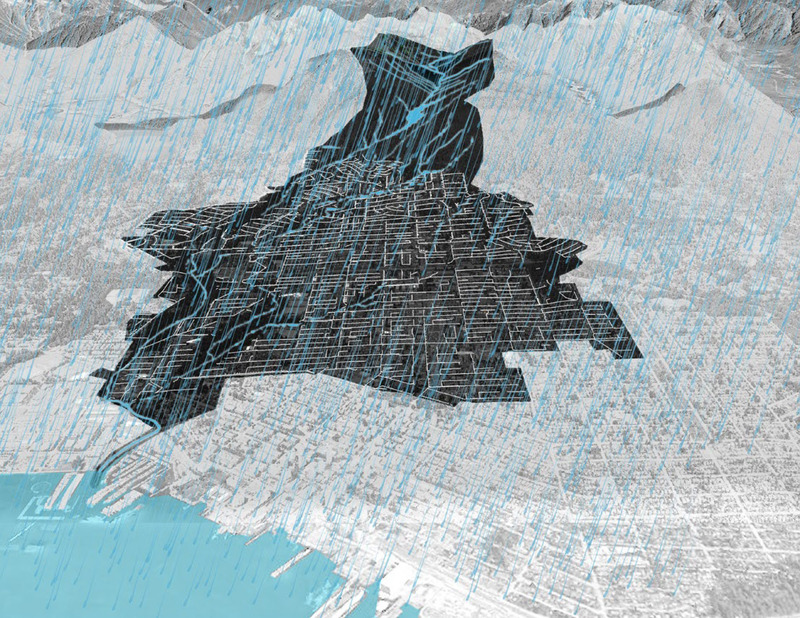 This thesis project addresses the management of rainwater in cities. First, through an in-depth analysis of the problems with the conventional top-down approach and how these can be addressed both through policy change and through more targeted and organized municipal initiatives which encourage the uptake of rainwater source controls by citizens. Secondly, through a bottom-up approach seeking to address the apathy of the general public towards rainwater. The design solution draws from theories in behavioral psychology, transformative education and interpretive landscapes to create a landscape that challenges the visitor’s preconceived notions of how water should be treated in cities. The landscape is used as a tool, or, milieu to deepen the ‘modern city-dwellers’ understanding of rainwater and to strengthen feelings of responsibility.